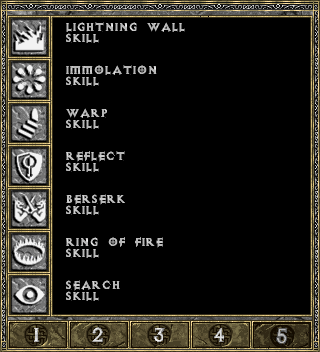 Unlike Diablo II with its skill trees of unique abilities for each character, Diablo featured no special attack skills at all. In Diablo and Hellfire all of the characters can cast the same spells from scrolls, charges on staves, or from memory, after learning the spells by reading spell books. Casting spells costs mana, an amount that's different for every spell, and which (generally) decreases (to a pre-set hard cap) at higher levels of the spell. Spell levels max out at 15 from reading books. Various unique and magical items add 1 or 2 to all spell levels. Most spells can be found on scrolls, which have magic requirements to cast, but do not cost mana. Some spells can only be found on scrolls and not in spell books. Casting a spell from a scroll casts it at the level your character has learned up to (or level 1 if it's not a spell you have read a book for). The magic required to read a scroll is always the same no matter your level in that spell. The magic requirement to read a scroll is generally about 20% lower than the requirement to read the level 1 book in that skill. Values listed below. Most spells can be found in charges on items; on staves and some unique items. Some Hellfire spells can only be found on staves. Opening up your character's spellbook (S = hotkey) pulls up a menu on the right side of the screen. Every spell your character has learned (by reading a spellbook), is listed in the spell menu. There are four pages of spells in Diablo, and five in Hellfire. 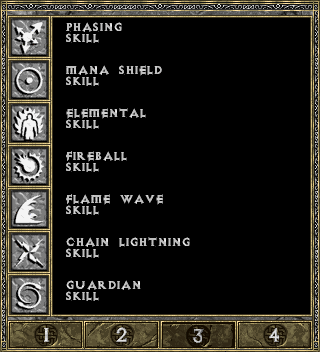 Spells are arranged (roughly) by increasing strength, with the spells with the lowest requirements on page one, and the highest on page four. The table below replicates the spellbook. 5th page appears only in Hellfire. Only found in multiplayer games: Heal Other, Resurrect. Spells added in Hellfire: Lightning Wall, Immolation, Warp, Reflect, Berserk, Ring of Fire, Search, Jester, Magi, Mana. Staves only: Jester, Magi, Mana. Each of the characters has an inherent skill of varying utility. They can use these skills from level 1, and they do not cost mana to use. Sorcerers can recharge the charges on a staff, though the maximum number of charges will always decrease slightly, usually by 1 or 2. A staff with 20 charges would go from 0/20 to 19/19 or 18/18. Since there is no way to increase the maximum charges on a staff, this skill should never be used on a staff you are using long term. However, if you find a staff of Fireball or Guardian early and just want to have some fun with it and cast a lot of spells without using any mana, knock yourself out. if CurChrg < MaxChrg, goto 3. The Warrior can repair the durability of an item, but the item will always lose a point or two of maximum durability. A sword worn down to 2/50 would be replenished to 49/49, for example. This should not be used on quality weapons you're going to keep long term, but it's very handy on items you know you'll replace if you do not want to return to town. Item durability can be increased in Diablo via Hidden Shrines, and by various oils in Hellfire, so repair-lowered durability can be regained. This skill isn't often needed in Diablo and Hellfire, since repair costs aren't that high and gold is plentiful. In various Diablo and Hellfire mods, this skill becomes far more important, since repair costs can be quite steep, and the higher difficulty means that repairs are required more often. if x + CurDur < MaxDur, goto 3. If max durability reaches 0, the item is destroyed. Bards are only playable in Hellfire, once they've been enabled by the Command.txt file. The Bard can use the Identify skill inherently, with no mana cost. She thus saves herself ever having to pay Deckard Cain 100 gold, and need not stay a while and listen at any time, other than when she needs his interaction to further a quest. The Monk has inherent access to the Search skill. It works just as it does for other characters; the Monk just doesn't need to read a book to learn it or spend mana to cast it. Determining your character's spell damage is notoriously difficult in Diablo and Hellfire, since the values scale up with character level. Determining the damage requires some math, which Jarulf explains in section 4.1.2 of his guide. How much good this explanation does you depends largely on how closely you're willing to embrace algebra. Since most readers feel their eyes glaze at the first equation, the calculation explanations are not reproduced here. The calculations are presented for each skill below, if you're mathematically-inclined type who can find some use from them. All spells cost mana to cast from memory (they are free from staves and scrolls). The amount of mana they cost has a preset value, which decreases by a set amount each level, until it reaches some preset minimum amount. There is a major exception to this, in that it costs Rogues, Monks, and Bards only 75% of the usual mana requirement. Warriors, Barbarians, and Sorcerers incur the full 100% cost, except in Hellfire v1.01, where the Sorcerer's spells cost only 50%. Regardless of the 50 and 75% values, no character ever expends less than the listed minimum. Casting spells from scrolls and staff charges does not cost any mana, but there are magic requirements. Staves: Magic requirement is equal to the magic required to read the level 1 book. Scrolls: Magic req is usually lower than staves/book reading. The following spells are found in Hellfire. Apocalypse and Nova are found in Diablo, but not in book form. See above for figure and column explanations. In Diablo, Rogues and Warriors can not achieve 255 magic no matter what equipment they assemble, (Rogues can get to 245, Warriors to 225) so can not read higher level spellbooks and must hunt for Enchanted Shrines to boost their spells to 15. In Hellfire all of the characters except the Barbarian can theoretically get to over 255 magic, thanks to some of the new uniques. (In practice this is unattainable, since Xorine's Ring is virtually unfindable due to a bug in the item generation routine.) See all the max possible attributes here. Books found only in Hellfire. Apocalypse and Nova are found in Diablo, but only on scrolls and staves, not books. The other spells are all new and unique to Hellfire. Information and relevant calculations for every spell in the game. Calculations from Jarulf's Guide. Apocalypse is the ultimate spell in Diablo. It creates a blossom of fire beneath a monster's feet, but is not fire damage. Apoc is a special type of damage that can not be resisted, and that no monster is immune to. In Diablo it hits everything on the screen, even over walls, and is frequently used to decimate the creatures inside of Diablo's square before the bone levers are thrown. In Hellfire the spell can be learned from spellbooks, but they are only dropped by Na-Krul, and the spell requires a line of sight to work; it can't be used over walls anymore. Speed: Hits everything in range when cast. Available: Scrolls and staves only in Diablo. On books as well in Hellfire, but the only way to get a book is to kill Na-Krul. A projectile spell most commonly seen being cast by Witches. Each Blood Star moves relatively slowly and in a straight line. There is no splash damage. Blood Star is the only viable, magic-type skill to kill targets at a distance, but the fact that it does so much less damage than comparable fire or lightning spells means it is very seldom used, except in special circumstances. In Diablo, there are no monsters who are immune to Fire and Lightning but not Magic, however there are a few such enemies in Hellfire. Bloodstar could in theory be useful, in combination with Bone Spirit to kill fire- and lightning-resistant monsters in Hellfire, with Bone Spirit to weaken the target and Blood Star to finish it. However, brute force often proves a more efficient follow-up to Bone Spirit, either using a Golem or a bow. Blood Star has a special extra cost to cast; draining 5 life along with the mana cost. When cast with a Mana Shield active, it costs 5 extra mana. This cost is applied even if it's cast from charges. Witches fire Bloodstars at a covering Rogue. Fires a pink, ghostly creature that moves relatively slowly, but that can home in on the target. The damage is percentage based, making this skill very damaging to monsters with full hit points, but virtually useless on ones nearer death. The damage is resisted, just like any other magic-based spell, if the monster has magic resistance. Like Blood Star, Bone Spirit costs life as well as mana to cast, draining 6 life along with the mana cost. This cost is applied even if the spell is cast from charges on a staff. It costs 6 extra mana if you have Mana Shield active. The biggest killing lightning spell in the game, and a spell that can deal the most damage per cast. Chain Lightning sends one bolt where your cursor points, and another one for each target in range (range is calculated without regard for walls or other obstacles), each time it is cast. The range increases with more points in the spell, as does the damage per bolt. This spell would clear entire levels in a single use if not for the "sprite limit" in Diablo/Hellfire. The game's engine will only display 255 sprites at once, and since each bolt from the Chain Lightning creates quite a few sprites, numerous "gaps" appear in the bolts. As a result, some strategy is required to use Chain Lightning effectively. Players need to know where the monsters are around them, whether they are on the other side of a wall or not. For instance, it's wise to stand beside a wall so not many sprites will appear in that direction when you want to fire them forward. Alternatively, hordes of monsters on the other side of a wall can be very useful if you maneuver so that the nearby monsters are between you and that wall with the monsters past it. See the Chain Lightning Tutorial for much more detail on this, with numerous screenshots. The damage from each bolt is calculated multiple times per bolt, as they appear to move past. According to Jarulf's Guide, each bolt does a hit check each 0.05 seconds, for a total of [slvl/2] + 6 times per bolt. One bolt shoots at each enemy in range. Positioning your character in a corner or against a wall, so the bolts concentrate on a few targets, instead of shooting in every direction, is an essential tactic. Charged Bolt sends out several small squares of electricity per use. These squares move semi-randomly in the direction the caster is facing, spreading out and usually bouncing off of walls. They are not especially damaging, but can be useful to "wake up" all of the non-lightning immune monsters in a room, bringing them out to fight while leaving the other monsters in the area undisturbed. This spell is especially useful against fast-moving monsters such as Balrogs or lightning-sensitive Witches. In Normal -aka Wimp- mode, a medium-level sorcerer with a reasonable level in Charged Bolt (10-15) and Magic (150-200) can wipe an entire level populated by Vortex Lords and Soul Burners in mere minutes while suffering little damage, using Charged Bolt only (tested by yours truly on dlvl 14 with a level 24 mage, 182 Magic and Charged Bolt level 14. It took 15 minutes and 2 mana potions, and felt waaayyy overkill). This spell can be quite annoying when used by mages; not for the tiny damage, but because it causes characters with a shield to stop to block. See the Charged Bolt Tutorial for very detailed information about and strategy tips for using this spell. Elemental fires a running, target-homing human-shaped fire elemental. This one is far less useful than it would seem, for while the damage displays the same as Fireball, Fireball is boosted by a buggy, non-displayed splash damage. Elemental does not deal that splash damage, and as a result it's less than half as damaging as Fireball. Even though it doesn't "splash" like a Fireball, each Elemental can hit two targets if they are very close together. Elemental splash damage is 1/64th of the total damage. It is applied each .05 seconds for .7 seconds (14 tries) and is not blockable. Thus, as is the case with Fireball, the splash damage from an Elemental will deal damage even if the spell itself is blocked. The most popular fire spell in the game, and a hugely damaging spell against single targets or tightly-packed groups. Fireball moves very quickly (increasing with Slvl) and its damage increases with Slvl and Clvl, making it indispensible for all Sorcerers and many other character builds as well. Each fireball deals a splash of damage that's equal to the damage of the spell itself. The fireball or the splash can be blocked, but not both, and monsters that can't block always take both, making this one basically double damage against most enemies. Like all projectiles in Diablo and Hellfire, Fireball is best fired at targets approaching in straight lines. It's extremely accurate against stationary targets, whatever their orientation to the caster. A fire projectile spell that's quite handy early in the game. It's basically a Fireball, but with much lower damage and no splash. The fire damage dealt by the dragons of the Guardian spell is determined by the Firebolt spell, so characters will want to max this one out, even if they never cast Firebolt itself. An extremely damaging spell to any target foolish enough to stand still in it. Multiple Firewalls can be stacked on top of each other, increasing the damage proportionally. Very useful early and mid-game, especially against monsters stuck on the other side of an obstacle. Most monsters will not advance into the flames, but this AI can be used against them. Simply cast a Firewall in front of them, and then cast one on top of them. They will stand and roast since they're not smart enough to move backwards out of the fire. This is a very popular way to kill Diablo himself. The central sprite of the firewall does double damage. Unlike most spells, Firewall can damage the player who casts it, and this damage is treated as fire from a trap (thus "of thieves" item will half it). Each space in the flame hits every .05 second for the duration. This spell basically creates a moving firewall, one that moves across the level until it hits a wall. The extend of the Flame Wave increases with more points in the spell, and it can be wider than the visible screen at high levels. The killing power of this one is far less than Fireball, but it's a useful way to wake up all of the monsters in an area and bring them out to fight without disturbing the fire immunes in the area. This spell can hit the player who casts it, (if you teleport quickly into it) and the fire is counted as damage from a trap. Flash is a sort of 1-space radius Nova spell, hitting anything in melee range with magical damage. This appears to be a powerful spell, by the damage display, but it's hampered by bugs and does far less damage than displayed. As most players have noticed, when basking in the ineffective version of it cast by monster mages. There are actually two spells cast; the first hits targets the left and below the character, while the second (less damaging) flash hits the three to the upper right. See the Flash Tutorial for more details and illustrative screenshots. Like other timed spells, Flash hits once every .05 seconds, for a total of 19 attempts in just less than a second. A summonable stone man, the Golem is a slow moving but fairly damaging companion, most commonly used by sorcerers against triple immune monsters. Golems can also be helpful to distract enemies, and to kill targets on the other side of a wall. They benefit greatly from the stone curse spell, since if their targets are stationary and helpless, the golem hits with every strike and takes no damage during the battle. Without backup Golems are not useful against higher level melee monsters, who will kill them quickly. A single golem can terrorize entire levels in the Church, though. Think of Golems more as bodyguards than as scouts: they will happily take a hit for you or cover your retreat, but keep them backed up if you want them to last as on their own they will be helpless against powerful melee fighters, mobs, or fast-moving ranged attackers. They do regenerate HP though, and they will do a nice job at securing areas for you once the bulk of the opposition has been cleared so that they can regenerate between engagements. Artillery mages might also like having a Golem on their side when facing Hidden or "immune" ennemies. Golems are most useful against Advocates, since they can withstand a lot of damage from Flash spells, and are not touched by the Advocates' Fireballs. They are less successful against Witches, and take damage from Bloodstar. Also, due to a bug in the Golem's light radius (it's set to infinite) every witch on the level sees the golem the moment he's cast, and will fire at him if they have a line of sight (yes, that can be useful to take a pack of witches off your back). Golems home in on nearby enemies. If nothing is nearby, they will walk in the direction their caster is facing. Only one golem may be active at once. If the spell is cast again, an active golem will crumble to gravel. Players gain full experience for kills made by their golem. Golems are hostile to each other, and will fight if there are two of them (from two players) in the same area. Yes, this can be funny to watch. A three-headed, firebolt-spitting dragon is summoned, tunneling up from the ground in the location targeted with the spell. Guardians can only be cast in the line of sight, and not over walls or through doors. These are not especially useful to kill with, on higher levels, but are such fun to cast that many players enjoy using them anyway. They can be useful to shoot into a room you have not yet entered, but they are inefficient. The Guardians only shoot at whatever target is nearest, and if it's fire immune their shots will pass harmlessly. The damage from a Guardian is equal to the damage of the casting character's Firebolt spell; the damage listed on the Guardian spell itself is meaningless. Higher levels of Guardian affect only the duration of the dragon, not the damage. Players gain full experience for kills made by their Guardians. An essential skill for all non-mana shield using characters, and even those types enjoy it, from time to time. Higher levels (Slvl and Clvl) lower the mana cost and increase the healing, so it's useful to build this one up even for Warriors, Barbarians, and other rock-headed melee fighters. Reading lots of Healing books is mandatory for Barbarians, since the cost of Healing increases with the Character Level. As these screenshots illustrate, a level 29 Barbarian with typical equipment can't even come close to casting a Healing spell, at level 3 or even level 6, since his high level makes the spell cost far more mana than he can scratch up. Healing is cast when the spell is triggered, but only grants the healing effect if the casting animation is completed. Warriors and other slow casting characters might find this one impossible to use when in melee combat, since the monsters will keep hitting them and interrupting their casting animation. This spell is only found in multiplayer. It works much like Healing, except that casting it gives a target for the pointer, and the benefit will be granted to whichever player is clicked on. It can be hard to click on a friend, if they're moving or there are monsters crowded around them, and few players will wait on this spell, since drinking a potion is instantly beneficial. A projectile spell that fires a gray Firebolt. This one hits only the undead though, and the damage scales up quite quickly, so most sorcerers find it quite useful in the early going. The utility is quite limited by the fact that Fireball does much more damage as soon as it comes online, but moreover by the fact that there are no undead monsters found in the Caves or Hell. Hellfire added a few in the Hive and Crypt, but Holy Bolt doesn't do enough damage to be very effective in the late game. It is quite useful for one thing; luring Diablo out of his square, since he is the only monster affected by Holy Bolt on his level (or anywhere in the game deeper than about Dlvl 7). It can't kill him in any reasonable amount of time, but it will wake him up and bring him out without disturbing the knights and Advocates around him. Nothing resists Holy Bolt in Diablo. In Hellfire, Diablo and the Bone Demons are resistant to it. 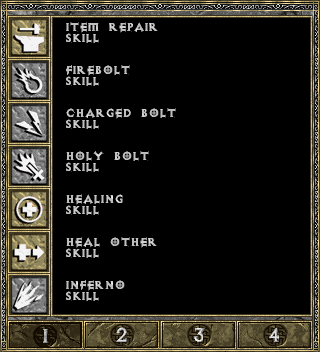 In Diablo and Hellfire, items can be equipped and used without being identified (magic/unique items must be identified in Diablo II before usage). All magical and unique items found in the dungeons or given as quest rewards are unidentified, and must be identified (by this spell or by Deckard Cain) before their special properties become active. It is not recommended to always identify items. For instance, identifying the Gotterdammerung activates the All resistance equals 0, which could make the item detrimental depending on your character and build. Note that items that have only negative modifiers would be worth less after being identified (plus you also wasted the 100 gold for the Identify scroll or Cain's service), indeed such an item is more effective when not identified. If you plan to keep the item for while, repair it first before identifying it; once an item has been identified the selling and repair costs go up considerably (assuming overall positive modifiers). Identify is not found on spellbooks, and can only be cast from staff charges or scrolls. Inferno looks like a powerful flamethrower of a spell, but it actually emits a fairly weak puff of flame that's less damaging than most other flame spells, and far less than Lightning Bolt. The spell always has the same range and duration, regardless of the Slvl or Clvl. The differences in damage are by distance from the caster. Inferno blows three spaces, and spends longer in each of them, progressively. Like other duration spells in Diablo, there is a damage check every .05 seconds, so Inferno hits 20, 25, and 30 times, moving away from the caster. Infravision shows every monster on the screen, even those over walls or otherwise out of the line of sight. Monsters in sight display normally; monsters out of your sight show up in bright red. Their names and stats do not highlight, but recognizing them by type is easy enough. Infravision is only found only on scrolls, staff charges, and as the benefit after drinking from a Murky Pool. It's never found in book form. Lightning fires a wide strip of lightning at high speed in a straight line. Lightning passed through all soft targets, only vanishing once it runs into a wall or other solid object. It's the first really useful combat spell most Sorcerers learn. The listed damage isn't that much higher than Firebolt or other early spells, but this one's ability to hit multiple targets, and to hit each one multiple times, makes it quite powerful. Each bolt hits multiple times, calculating the damage every .05 seconds, for a total [slvl/2]+6 times. A defensive spell, Mana Shield allows the caster to lessen the damage taken, and causes all damage taken to deduct from the mana pool, rather than from the life. This spell is mandatory for higher level Sorcerers who usually have hundreds of more points in mana than life, but can also be used by Rogues and other characters with moderately high mana who need or want an extra defensive buffer. Mana Shield turns off each time your character leaves a level, so be sure you recast it first thing after you take the stairs down. Countless Sorcerers have stupidly lost their lives teleporting right into battle without first engaging their Mana Shield on the new level. If a character takes damage greater than their current life, they will neither be stunned nor pushed back by it. This can be exploited with mana shield and -life equipment (or bugs, such as the yellow zombies removing 1 life point permanently with each hit in early versions of Diablo). Damage reduction in Hellfire: Bugged. The spell is supposed to increase the damage reduction with increasing levels, but actually does the opposite. Formula: 100/(3· slvl)% The max slvl is 7, in this formula. Duration: Infinite. Only ends when mana drops to zero, or when you leave the current dungeon level. A powerful lightning spell, Nova sends out an explosion of lighting in an expanding circle; albeit one riddled with gaps. Nova is more useful than Chain Lightning only when totally surrounded by monsters, when the sprite limits would cut Chain Lightning's effectiveness. Nova is only found on scrolls and staves in Diablo. In Hellfire it can be found in book form. This spell is a random teleport. Using it instantly transports the player to a random location somewhere on the visible screen. It's only utility is as an emergency escape spell, if your character is surrounded by enemies. Since Phasing is non-targeting, it casts .05 faster than Teleport, and can therefore be useful to escape when stunlocked. Warp is a better choice in Hellfire, since it will take you further away, and to a predictable location. Only available in Multiplayer. Resurrect is targeted on a dead character's corpse. It will always bring them back to life, there's no skill or level check. Resurrected characters have 10 hit points (or less, if their maximum life is lower than 10) and no mana. A hugely useful spell, Stone Curse turns the targeted monster to stone, rendering them statues: helpless, immobile, and defenseless. Immunities are not countered, but stoned monsters have zero Armor Class and will be hit by every attack. They remain material objects, and must be walked around by other monsters. A row of stoned monsters can provide a useful barrier against enemies. Diablo, Na-Krul, and other players are immune to stone curse. Monsters that are already stoned, or who are charging or phasing in or out are temporarily immune to stone curse. Mages will dodge it at times; teleporting once, then again if you attempt to stone them as soon as they reappear. Allow them to rematerialize long enough to attempt to cast a spell, then stone them. You can not cast it on your own Golem. Stone Curse can not be cast again on a monster that's already stunned. You must wait for it to wear off before casting it again on the same target. A spell used to pick up items from a distance, or to throw switches, pull levers, activate shrines, etc. It works over walls on any item or object you can see. Very useful to retrieve items after dying, to open up Diablo's box without entering the other boxes, to use shrines or grab books from bookshelves from a distance. Players must have enough space to hold the item they attempt to pick up with TK. When used on monsters TK can knock them back. This does no damage, but counts as a form of damage sufficient to enable the TK'er to receive experience when another player kills the monster. Using TK on a stone cursed monster will immediately remove the Stone Curse effect. Some superunique monsters are immune to TK: Snotspill, Gharbad the Weak, Zhar the Mad, Warlord of Blood, Lachdanan, Arch-Bishop Lazarus, Blackjade and Red Vex. One of the most useful skills in the game; teleport allows your character to move to any location you can point to, whether you have a line of sight there or not. Great to move quickly around the levels, to escape monsters, to back up to gain more room to fire spells or arrows, etc. When cast by selecting Teleport on the right skill icon, the spell will be cast instantly with a right click. When cast by right clicking on a scroll in the inventory or belt, the cursor becomes a targeting arrow and the character moves with the next right click of the mouse. Players create a blue portal that can be stepped into to return instantly to town. Town Portals remain open indefinitely, until the character who cast it uses it to return to the dungeon from town. If two or more players cast town portals, they can keep them open forever by only returning via the portal cast by the other player. Each character can have only one active Town Portal, and if a second is cast the first will vanish. An open Town Portal also increase the light radius in the dungeon. Brand new spells introduced in the Hellfire expansion pack. None of these can be found in Diablo. Some existing Diablo spells were also modified in Hellfire, as noted in the above section. Apocalypse and Nova are findable in book form in Hellfire, when they were only scrolls/staff charges in Diablo. As the eternal struggle between the forces of Light and Darkness rages on, all of the powers in the universe bend and twist in the storm of their conflict. The realms of the physical plane warp and merge with the planes of the ethereal, and chaos grows stronger while magical essence seeps into every corner of reality. In the past, those who studied the arts of magical and wielded the forces of the arcane were capable of learning and retaining only four pages of spells, and thsi only through tremendous difficulty and long hours of study. Now, as more spells and sources of Mana are created or unearthed from ancient places of power, many magic users have found that they can obtain and remember a fifth page. Berserk is a curse-like spell that resets a monster's AI, and makes them hostile to their own kind. Monsters will fight other monsters when Berserked, but they are not necessarily on the character's side; they simply attack whatever is nearest. This spell is best used as a decoy or diversion; turning an army of monsters with Berserk can be amusing, but it's not an especially viable strategy. Berserked monsters deal enhanced damage, (20-30% + Slvl). Players do not receive experience for monsters killed by a Berserker. Berserkers are not immune to player damage, and can be killed just like any other monster. Though Berserk does not deal direct damage, it is considered a form of magic, and thus will not work on magic immune monsters. All unique and special monsters are also immune, as are monsters in mid-charge or who are phasing in or out. There is a 50% chance that magic resistant monsters will not be Berserked. The use and control of the magical forces of Mana have many manifestations, almost all of which involved channeling this etheral energy into concentrated and focused forms, such as the many spells realted to Fire or Lightning. However, as the Horadrim experimented and mastered the arcane powers, they discoverd that nearly any forces could be controlled and reshaped or re-oriented, including mental and bodily energy. With this understanding, they soon created spells to influence the thoughts and actions of other creatures. The most aggressive of those magics caused a target creature to gain a burst of great strength and go made with rage. Frenzied with blood lust, the creature willing attacks any nearby living being, whether friend or foe. Entities with natural evil intent and weak minds ended to fall under the influence of this spell easily, and the Horadrim had great success using this maddening incantation to incite Demons and other foul creatures of blackness to blindy attack one another during the heat of combat. A warning to novices seeking to use this dangerous spell: the fury of an affected creature knows no bounds, and if not careful or safely distant, the caster of this spell may very well end up being the target of the berserk creature's rage. A fire-based version of Nova; this spell shoots out a ring of Fireballs. They are much less damaging than actual Fireballs, and do the same damage as Nova, but look just like Fireballs. Harnessing the forces of Mana and converting their energy into the form of Fire has been a skill long practiced by even the most inexperienced of magic-users. Absolute control and manipulation of the magical Fire is another matter entirely, and only the most learned of the great mages have attained such ability. Of the many spells that channel flame into the form of a weapon, the most effective, perhaps, is Immolation. Radiating outward from the caster, multitudes of Fireballs tear through the air, forming a circular swath of destruction as they explode on impact and burn any creatures in their paths. An extremely damaging spell to any target foolish enough to stand still in it. Multiple Lightning Walls can be stacked on top of each other, increasing the damage proportionally. Most monsters will not advance into the lightning, but this AI can be used against them. Simply cast a Lightning Wall in front of them, and then cast one on top of them. They will stand and sizzle since they're not smart enough to move backwards out of the line of fire. This is a very popular way to kill Diablo himself. The central sprite of the Lightning Wall does double damage, so be sure you target the monster you are using it on. Like Firewall, Lightning Walls work best when cast in a straight line, rather than diagonal, since there are gaps between the active sprites on diagonal walls. Lightning Wall deals double the damage of a Firewall, but it seems to have more gaps and spaces, since monsters are more likely to walk right through it. Unlike most spells, Lightning Wall can damage the player who casts it, and this damage is treated as lightning from a trap (thus "of thieves" item will half it). Each space in the charges hits every .05 second for the duration. The electrical energy of Lighting, when channeled by an able magic user, is a deadly and powerful weapo,. Shaping this dramatic force of nature into the form of a barrier wall requires great concentration, but can be used as an extremely effective defense against an onslaught of murderous foes. As understanding and control of this spell grows, the endurance of the wall can be increased, providing the caster with longer periods of protection. Found only in charges on staves, the Magi charges work like drinking a full mana potion. They completely refill the mana of the caster, unlike the partial mana fill granted by the Mana charges. A spell that works just like healing, but one that refills the mana globe instead of the life bulb. The Mana spell is cast when the spell is triggered, but only grants the mana filling effect if the casting animation is completed. Warriors and other slow casting characters might find this one impossible to use when in melee combat, since the monsters will keep hitting them and interrupting their casting animation. This spell creates an armor icon that floats above the character's head, much like the mana shield graphic. It's used by melee fighters and other characters who wish to reduce the damage they take from being hit by melee attackers. Reflect reduces melee damage by 20-29% and reflects that much of the damage back to the attacking monster. The spell lasts for a given number of hits, or until you leave the current dungeon level. It's a good idea to recast this one after each major battle, lest it expire in mid-battle and leave you surrounded and taking extra damage per hit. A higher Slvl allows the spell to take more hits before expiring. Blocking counts as a hit to Reflect. Duration: slvl·clvl hits. Or until you leave the current dungeon level. By nature, magic users are usually not gifted in physical skills such as hand-to-hand combat, focusing rather on mental discipline in order to further their understanding and control of mystic powers. However, even the most adept of mages often find themselves sin great physical danger while exploring savage places searching for arcane knowledge. To compensate for this vulnerability, the Vizjerei developed a form of telekinetic magic that bends the force of a physical attack back onto the attackers. Aided by this reflective spell, even the meager melee combat skills of a mage can prove to be quite effective. An aggressive creature becomes the victim of not only the mage's blows, but also of its own. Ring of Fire casts a circular Firewall all around the player. It does the same damage and has the same duration as Firewall, but there are gaps in the circle that monsters will enter through, so it's not a very effective defense, in of itself. Players will take damage from their own Rings of Fire, with that damage treated as though it had been inflicted by a trap. The flame does a damage check every .05 seconds for a total of 160 + 160·slvl times. Perhaps the most useful feature added in Hellfire, this one causes items on the ground to light up as though they were being highlighted by the pointer. It also makes dropped items show up with a blue square on the minimap. Search in vain for that dinging ring no more. Search is an inherent skill for the Monk class. Other characters must learn it from books and spend mana to cost it. Casting Search several times in a row will make it last much longer than it does from a single cast. Over the ages, many mystical cultures have delved into the nature of matter and energy while exploring the manifestations of magic. Out of this research came the ability to attain heightened perceptions, and, for those individuals of appropriate mental and spiritual discipline, this ability has proved to be a tremendous asset. For instance, the Monks of the Brotherhood of the Bough learned to focus their perceptions and concentration to such an extent that they could clearly see almost any visible object, no matter how distant, camouflaged, or obscured. The Vizjerei studied and learned from these people, and managed to bend the arcane forces into spells that could mimic their fine mental disciplines. Thus, magic users can include in their arcane arsenal the spell of Search, which, which invoked, makes clear to the caster all items and objects lying about. This spell has often proved to be invaluable to the adventurer wandering through dark, cluttered places eking treasures. Works like Phasing, but instantly teleports the character to the nearest stairway. A useful escape skill, but also helpful when rushing through levels and trying to find the way down, which most players do in the Hive, for instance. The key to using it well in that way is to get away from the stairs going up. Teleport or hustle to some distant corner of the map, cast Warp, and you'll pop straight to the stairs down, if they're closer than the ones you started from. If you return to the starting spot, then run in a different direction and try it again. In ancient times the Horadrim built many magical gateways, and though the secret of their construction is long lost, many uses and manipulations of these portals have evolved over the centuries. Akin to the spell of Town Portal is the spell of Warp, though far less versatile as a means of exact teleportation between two specific destinations.Rather, Warp sends the caster on a one way trip to teh nearest exit from a place. Immediately thereafter, the portal is closed and dissipated, leaving the traveler with only conventional means with which to return to the point of casting. Limited as a means of travel, this spell can, however, prove to be extremely useful in finding an exit when the caster is lost or besieged in a dark and dangerous place such as a dungeon or cave. Unfortunately, the forces drawn upon by the warp sell make no distinction between types of exits, since they merely focus their energies on the nearest at hand. As often as not, the caster is sent to an exit downward, which almost always leads to even greater perils. Many of the spells in the demo were unbalanced and buggy, but they had some interesting effects not found in the final game. We don't have full stats for these, just the icons and a quick description of how they worked. Thanks to Lady of the Cake and Diablo Evolution for most of the info in this section. 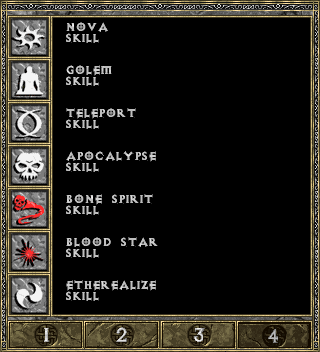 The following skills were only found in the demo, and are not in the final game, though a few of the icons were eventually reused. An odd sort of proximity-based magical attack. When cast with enemies nearby, they would take huge damage, as though their blood was boiling from within. Presumably it did not work on undead, since skeletons pretty clearly lack blood. In the PR demo, apparently the spell was changed to (or first implemented as) a point and click spell. It would blow up the target from within, killing it instantly and dealing damage to the caster equal to (100 -(12,5*slvl))% of the target's maximum hp. Mana cost started at 18 and decreased by 2 per level. A spell-casters aid, this one transferred health points to mana points. It was taken out because the mana bonus was higher than the health cost, which meant it could be used together with Heal to give a character infinite health and mana. A projectile spell that shot a missile consisting of two snakes corkscrewing around each other. This would home in on a target, possibly hitting two targets much like Elemental, but did not appear without a valid target. It damaged only beasts (and the Butcher). Temporarily turned a character invulnerable. Graphics were a gold ring that fit exactly around the Mana Shield orb. From an early vision of Diablo, when stealth and tactics were part of the plan, rather than massive brute force destruction. 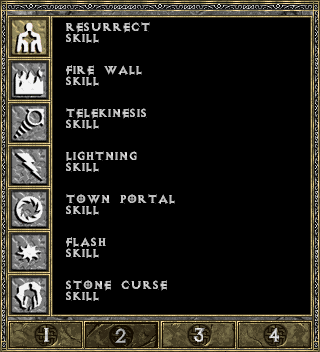 If the icon looks familiar, it was used for the Sorceress' teleport skill in Diablo II. A sort of traveling Guardian, this one summoned an eyeball that hovered beside your character and shot Firebolts at nearby enemies. It followed, but lagged a bit, and could be led into a room, then left inside with the monsters if you hurried out and shut the door. Monsters did not attack the Sentinel as they do not attack Guardians. This page was last edited on 20 June 2013, at 01:24.